Join the Joplin ODOR ISSUES GROUP - What the **** is that Smell? 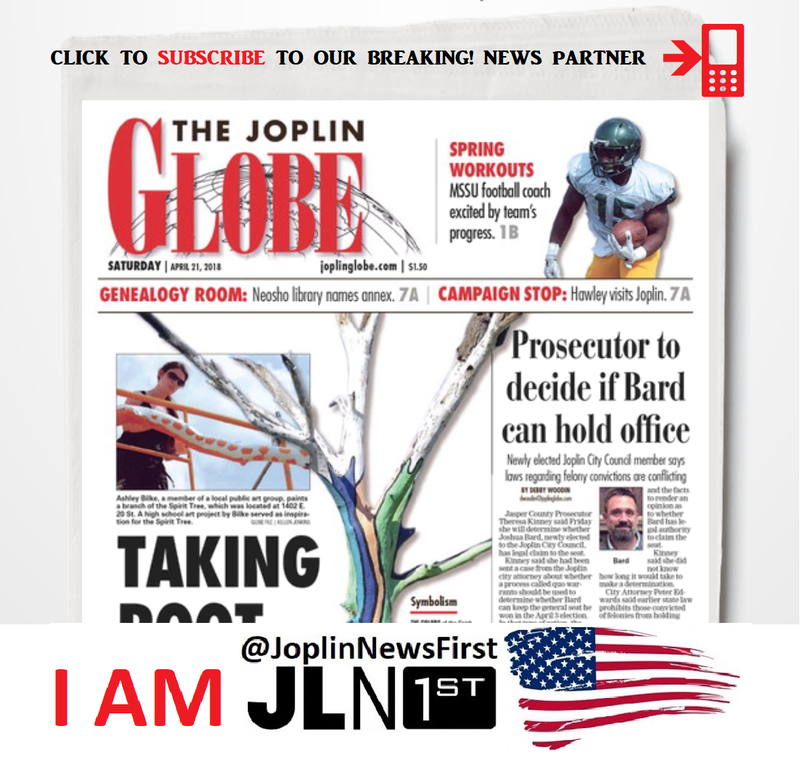 (64801) -- Joplin News First tipster and friend, Paul, let us know about police activity and the road blocked on St Louis between Broadway and 3rd. We were the first to tell you about 'shots fired in a residence' and to stay away from the area for your safety. During our live broadcast we were interrupted by a call from JPD informing us at 5:06 pm JPD received a call of shots fired in a residence at 132 S St Louis. According to eyewitnesses on the scene there were adults and children in the residence. Everyone - children included - left the residence but one person remained behind. It appeared to be a stand off with one individual who would not leave the residence. You could hear police using a bullhorn during the 45 minute stand off. Capt Trevor Duncan of JPD spoke exclusively with Shannon Becker then on camera. The suspect was taken into custody. There are no reported injuries and traffic would resume quickly. Here is the official statement that was posted on social media by JPD while we were still live on the scene. Update: roadway is being cleared, a shooting suspect is in custody. No reported injuries at this time and an investigation is underway. Original call was a shooting inside the residence at 132 South St. Louis. Full details will be released tomorrow. (64804) – Bonnie and Clyde called Joplin home for 13 days back in 1933. Traveling across the Midwest during the Great Depression, with their gang, robbing people and killing when cornered or confronted. It's no doubt they are possibly the most famous and most romanticized criminal couple in American history. And now you can step back in time and experience history since their 'hideout apartment' is part of the Airbnb community. The story goes that police were tipped off and showed up here on April 13, 1933. There was shootout - tragically killing 2 local law enforcement officers. Bonnie and Clyde & their gang fled but left things behind like jewelry and a roll of film. The Joplin Globe developed the film for the Joplin Police and FBI. That picture published was the first image America had of these criminals who called Joplin home for a few weeks. And it's the same photo still most-recognizable to this day. If you are tech-savvy then you know about AIRBNB, aka Air Bed And Breakfast. It's where you can rent a room or home like you would a hotel room for a nightly rate. If you need to catch up a little (like us), all communication goes through the AIRBNB site, using only first names keeping it professional between owner/renter so you don't have to navigate personalities. Let AIRBNB do the middle man work. Is it safe to rent from an individual instead of a hotel? These 'technology based companies', aka TNC's, meet MO state requirements so no need for business licenses, permits, inspections etc. The background and information the TNC gathers meets the state requirements. Then reviews and reports from consumers assure AIRBNB and future renters that it continues to be a clean and safe environment. AIRBNB goes on to state, “This five room apartment is located upstairs. The Barrow gang chose this location due to the 360 degree views from here, making the apartment bright and airy. You can watch the original movie "Bonnie & Clyde" in the living room where some of the events took place. (64804) -- Linn grew up in Reno Nevada. Moved to Las Vegas and became a successful esthetician in the posh casino salons. She co-owned salons from Vegas to Nashville but settled in Joplin and opened The White Rhino salon with her husband, Shane. She didn't know waiting in her genetic line was the marker for Huntington's Disease. TEAM HOPE WALK JOPLIN, "It's not a 5k or marathon but more of a ceremonial 1 mile walk at Landreth Park", says Ciarra Berkowicz with her mother Linn. "It's really about families, the silent auction and a way to show support to each other." Huntington's or HD is a genetic disease that is passed through family lines. However most already have children before the typical 40 year old onset. There is no cure for HD. And the Joplin families that watch their loved ones descend into this 20 year illness come together once a year for the TEAM HOPE WALK JOPLIN. @JoplinNewsFirst wants to remind you they are working hard to find a cure for HD. Every step we make and every dollar we raise takes us one step closer to a cure. Please SHARE and support TEAM HOPE WALK JOPLIN.